We create and design the city as an open space of education by combining urban development and pedagogy. The ability of consciously perceiving environment and analyzing its effects ensures active participation and identification. Throughout democratic processes of education, we want our participants to critically question powers of planning and develop consciousness of urban locations, whether they are classrooms, schoolyards, parks or public spaces. 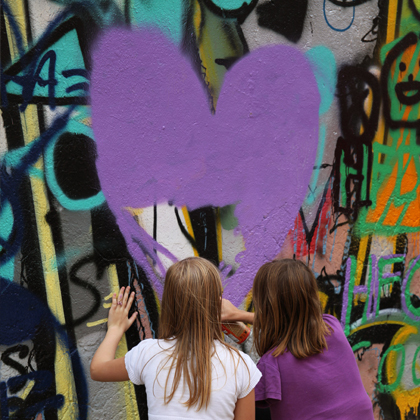 No matter, if three hours, a whole day or week – our offers reach from graffiti workshops or participative wall paintings to the modelling of future playgrounds. We like to create individual offers. 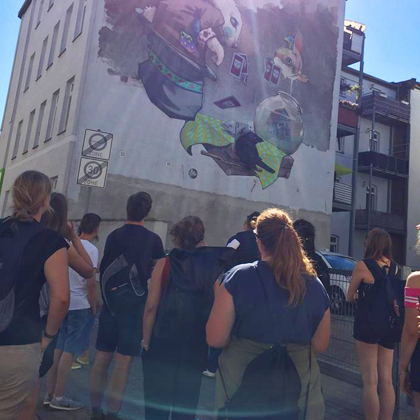 We offer guided tours across the colourful quarter of Freiimfelde. Every group lays the focus on something different – from artistic topics to urban planning or civic engagement, everthing is possible.